My third project with Aperion, and my second with David Stewart consisted of a “Build Your Own System” project. 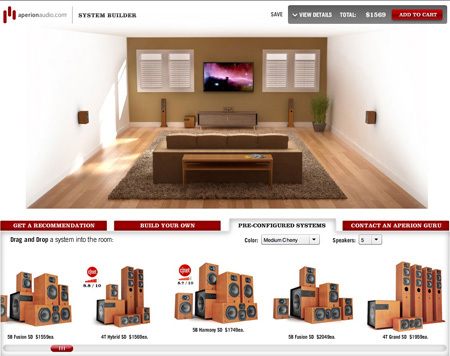 This was an online application found on the Aperion website which allows people to drag and drop speakers into a pre-defined room, or the users can select from pre-configured systems. Aperion provided me with dimensions for 3 room sizes: large, medium, and small. David provided the direction as to what to place the rooms. This was another Vray project which posed many challenged. As you can see above, there is a large shag rug in the scene. I used Cinema’s hair plugin to create the rug, and we consistently ran into problems in rendering the simple scene, as the rug had too many polygons. It was quite the process getting this all rendered believe it or not. the second test was in how to “build” the rooms with flash. David’s direction was to animate all the elements into the room. This can be done pretty easily as long as you keep the footage one long animated image sequence right out of cinema. But David was wanting to get each furniture element as a separate file so that he could do the animation in flash, which was much more time consuming on the 3d side. Aperion’s budget and our schedule ended up being the defining answer as to which way to proceed. No animation at all. Next challenge was rendering all the speakers within the 3 rooms. There are dozens of speakers, and you can pretty much put any of the speakers into any of the positions in the room. Front, front center, side, rear, ceiling, wall, etc. Becomes a little mind boggling. We ended up keyframing it out in cinema. So if there were 8 positions, each speakers would get rendered in each of the 8 positions. We had to make sure to place the pivot point of all speakers at the bottom rear of each speaker to make this as automated as possible. We also rendered an ambient occlusion pass and an alpha pass for each frame. Last was to composite it all together in AE, which posed some issues. Vray’s physical camera tag does not match the default c4d camera, so when we rendered the AO pass, the camera angle was ever so slightly off. Very annoying. Overall it turned out pretty well. This entry was posted	on Sunday, December 7th, 2008 at 4:25 am	and is filed under 3D. You can follow any responses to this entry through the RSS 2.0 feed. You can leave a response, or trackback from your own site.